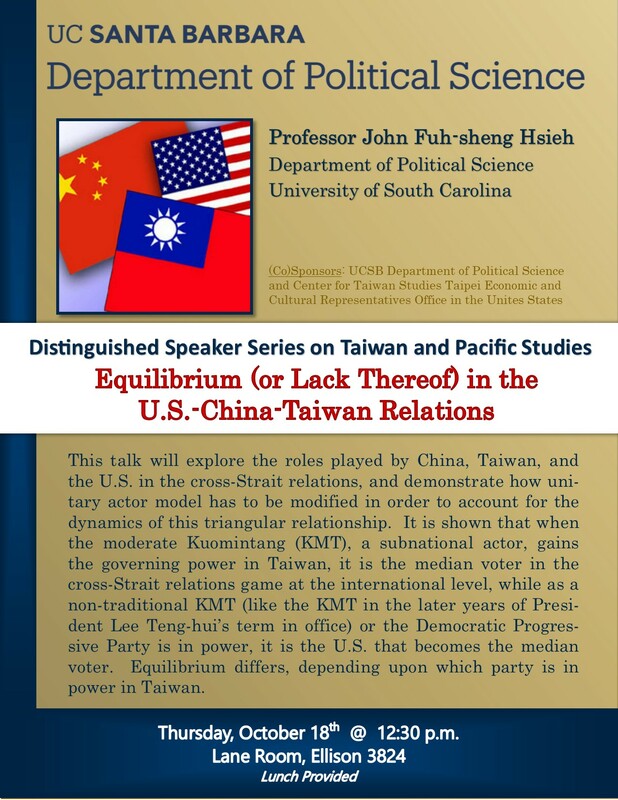 This talk will explore the roles played by China, Taiwan, and the U.S. in the cross-Strait relations, and demonstrate how unitary actor model has to be modified in order to account for the dynamics of this triangular relationship. It is shown that when the moderate Kuomintang (KMT), a subnational actor, gains the governing power in Taiwan, it is the median voter in the cross-Strait relations game at the international level, while as a non-traditional KMT (like the KMT in the later years of President Lee Teng-hui’s term in office) or the Democratic Progressive Party is in power, it is the U.S. that becomes the median voter. Equilibrium differs, depending upon which party is in power in Taiwan. Prof. Hsieh received his Ph.D. in political science from the University of Rochester in 1982. Currently, he is Professor at the Department of Political Science, University of South Carolina. He has been active in scholarly activities, serving as secretary-general of the Chinese Association of Political Science (Taipei), chairman of the Comparative Representation and Electoral Systems Research Committee in the International Political Science Association, and coordinator of the Conference Group on Taiwan Studies, a related group in the American Political Science Association. He is currently president of the American Association for Chinese Studies. Prof. Hsieh’s teaching and research interests include rational choice theory, constitutional choice, electoral systems, electoral behavior, political parties, democratization, foreign policy, and East Asian politics. He is the author or co-author of five books in Chinese. In addition, he is the editor of Confucian Culture and Democracy (World Scientific, 2015) and co-editor of How Asia Votes (Chatham House, 2002). His English works appeared as chapters in many books and in such journals as International Political Science Review, Electoral Studies, Party Politics, Public Choice, Representation, Cambridge Review of International Affairs, Asian Survey, Asian Perspective, China Quarterly, Journal of Contemporary China, Journal of Chinese Political Science, American Journal of Chinese Studies, Journal of Asian and African Studies, American Asian Review, Issues & Studies, and Chinese Political Science Review.